In an article in The New York Times, Dave Itzkoff describes filmmaker and comedian Michael Moore as "a 63-year-old hybrid of Noam Chomsky and P. T. Barnum." Now he's coming to Broadway. The Terms of My Surrender is already running previews and is set to open on August 10 at the Belasco Theatre. What can lucky ticket holders expect? This outspoken critic of what he sees as the many warps and foibles of American culture and politics has stated that he has not come to Broadway "to conduct a political rally." He plans to tell some stories in the hopes that he can make audiences feel better and "emerge rejuvenated after a months long period of feeling beaten down." As Itzkoff points out, Moore sees himself as eschewing both sides of the political aisle and marching instead to his own drummer. Before the 2016 election, he predicted and then listed the reasons why Donald Trump would be elected President. Now his one-man show is arriving "amid a period of liberal soul-searching, when any vaguely oppositional voice, whether a left-leaning columnist or late-night host, has gotten a second wind." 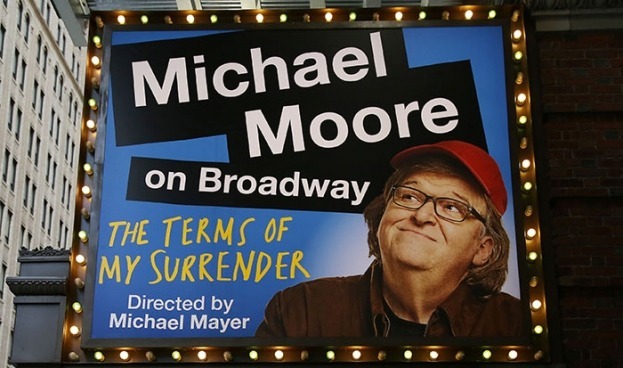 Moore has proven with his impressive mix of prophetic documentaries and hilarious bestselling books that he is a major voice in these strange and troubling times. Let's keep our minds and hearts open to the warnings, messages, insights, and suggestions that Moore has put together to shake us up, shock us to the core, and also give us some hope.